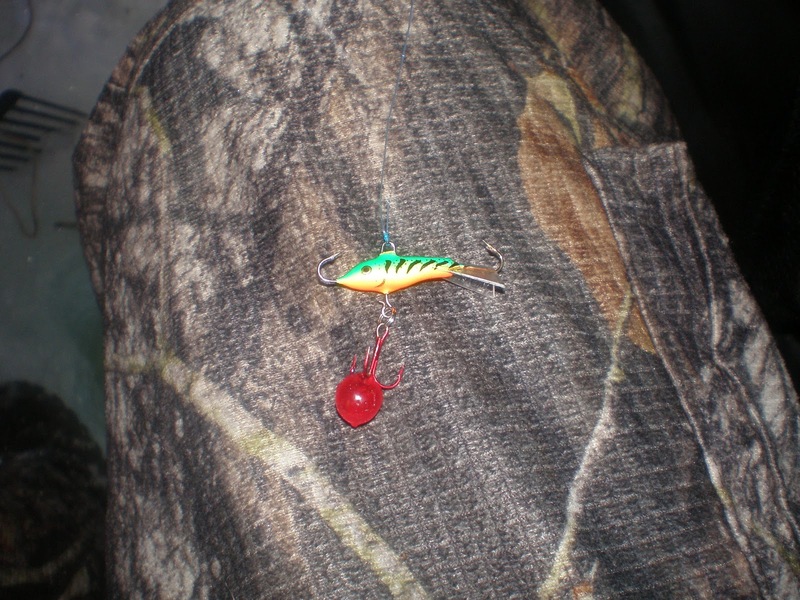 One of my favorite lures is a jigging rap made by Rapala. A jigging rap will catch fish all year round but I prefer to use them during the winter when I am ice fishing. Jigging raps come in all different colors and sizes but my favorites are the firetiger,chrome blue and glow versions. I like to use the chrome blue when the water is clear and the firetiger and glow when the water is stained. I have these colors in all the various sizes but I prefer to fish with the smallest size up to the third smallest. A jigging rap has two permanent hooks on both of its sides and then a treble hook that hangs below the body. I know a lot of guys that pop the permanent hooks off because sometimes the jigging rap will get caught on the sides of the hole causing the angler to lose the fish. When fishing a jigging rap, make sure you have a set of pliers with you. The first time a small perch grabs the rap, you will have a hard time getting the fish unhooked and the school will move on... I found this out the hard way. I like to tip the treble hook of the jigging rap with a red ball soaked in anise oil but anglers also use full minnows, minnow heads, grubs and even perch eyes as bait. I prefer the red ball because for a couple bucks you can get a jar full of them. They will last you for years because they rarely come off of the hook. The jigging rap is designed to mimic an injured bait fish. I think the red coming out of the stomach area triggers the perch to bite. I always start with a jigging rap when I am ice fishing because they have great action and if you fish them correctly the aggressive perch will charge in to take a look. A mistake a lot of anglers make is to lower the jigging rap to the bottom of the lake right away instead of fishing the whole water column. I like to first fish 2 or 3 feet below the hole. If unsuccessful, I lower the bait down a couple more feet and try that depth. An angler has to remember, the fish are not always on the bottom of the lake. If you can find elevated fish, they are normally more likely to bite. To get the best action out of the bait, I will lower it to the depth I want to fish and then slowly lift my rod up six inches to make the bait rise. I sometimes jerk the bait up if I am not having luck but I am most successful when it takes at three seconds or more for the rod to move up six inches. Once I raise the bait, I slowly lower the rap down to the starting point. When lowered, the jigging rap circles down and this is when most fish approach the lure. When a fish approaches the jigging rap, they will either charge in and smack it, slowly come in and then eventually bite, or slowly come in and then take off for whatever reason. When I have a fish staring at the jigging rap, I will stop jigging and slowly raise the bait up in the water twitching it all the way up until the fish looks like it is going to bite. I think this process mentally triggers the fish to bite because they see the jigging rap from a distance and think it is injured. As they approach the bait, they think the injured prey is trying to escape so they attack. Next time you venture out for perch or walleye, bring a couple jigging raps along and you will definitely see some fish as long as you stay active and do some hole hopping.